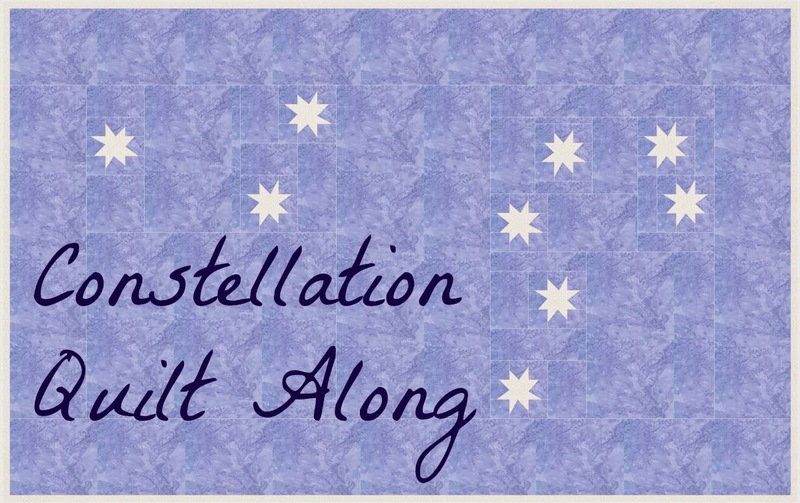 Welcome to the second installment of the Constellation Quilt Along. 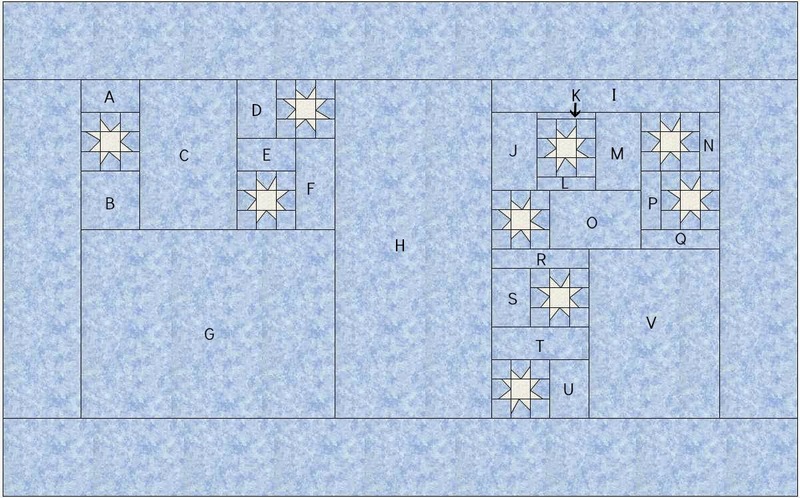 Refer to this layout diagram for quilt top assembly. Use 1/4" seam allowances. Cut each piece to the size listed (includes 1/4" seam allowance). Label each piece with a piece of masking tape marked with its corresponding letter in permanent marker. D: 3 1/2" x 5"
F: 3 1/2" x 7 1/2"
H: 12 1/2" x 26 1/2"
J: 4" x 6 1/2"
L: 5" x 1 1/2"
M: 4" x 6 1/2"
O: 7 1/2" x 5"
Q: 6 1/2" x 2"
S: 3 1/2" x 5"
U: 3 1/2" x 5"
V: 10 1/2" x 13 1/2"
First, attach the long side of A, D, E, K, N, O, P, S, and U to star blocks. Then, attach B to the A unit, F to the E unit, L to the K unit, Q to the P unit, R to the S unit, and T to the U unit. Next, attach C to the AB unit, D to the EF unit, J to the KL unit, N to the PQ unit, and RS to the TU unit. After that, attach ABC to DEF, JKL to M, and RSTU to V. Then, attach ABCDEF to G and JKLM to O. Attach ABCDEFG to H and JKLMO to NPQ. Add I to JKLMNOPQ. Attach IJKLMNOPQ to RSTUV. Attach ABCDEFGH to IJKLMNOPQRSTUV. Lastly, add the borders. If you are joining along, upload pictures of your progress to the Flickr Group. Aww, you're not going to post instructions for all the major constellations?! Not that I don't like Leo, being a Leo and all...and I really don't know which constellation I'd choose anyway. I wouldn't hold your breath, Renee. Perhaps I could be bribed with jam. For now, I'm on to other projects. I got apricots from a neighbor and plums from a friend...and now have an abundance of jam from them too. Hello Afton, you inquired on my blog about my windmill quilt. I left you an email regarding it. Thanks for your interest. What a great idea this contellation quilt! Even without the special fabric. That's a great pattern for donation quilts. I'm planning to make a few when my sons go back to school. I think I will try you pattern. Thank you for the detailled instructions. It come together pretty fast. The most time-consuming part is the cutting. You are welcome for the instructions. Please send me a pic or upload it to the Flickr group if you make one. I'd love to see.